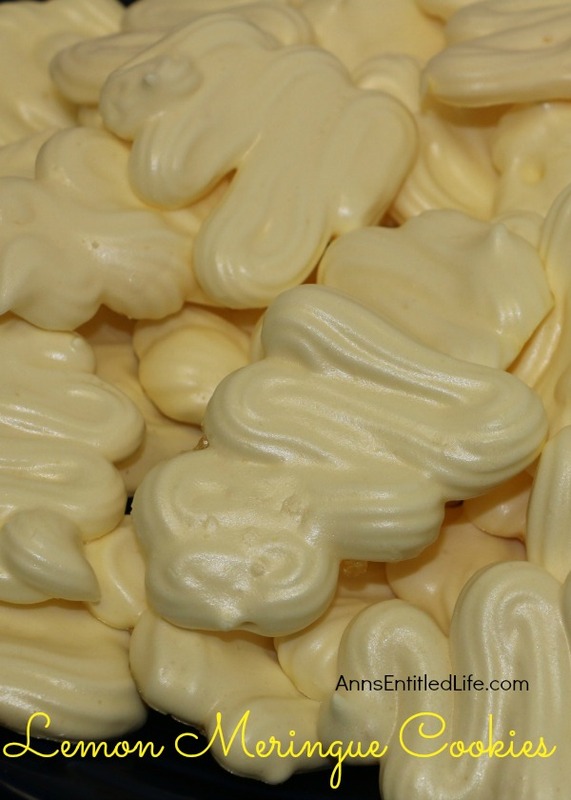 These Lemon Meringue Cookies are so simple to make, yet the sweet-tart flavor is complex, and very satisfying. 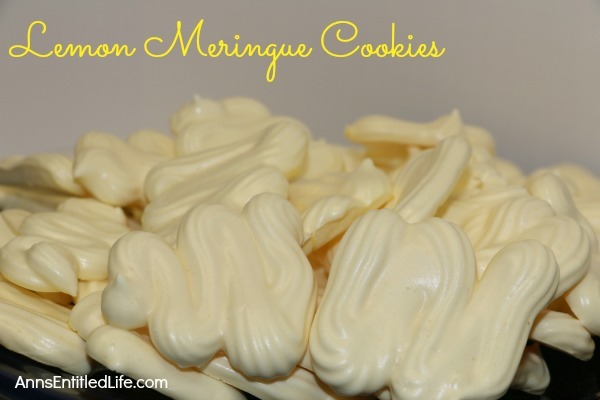 Get the fresh, crisp, light taste of Lemon Meringue Pie in a cookie! • Preheat oven to 175°. • Line 2-3 cookie sheets with parchment paper. • In a large mixing bowl, beat together the egg white, lemon juice and salt on medium speed until foamy. • Add the lemon extract, then the 3 drops of food coloring. • Slowly add the sugar, mix on medium until added. • Increase your mixer speed to high, and beat until the egg whites form a stiff peak. • Set up a large pastry bag with a star tip; fill with lemon meringue. • Pipe the lemon meringue onto the parchment paper. Form swirls, s-shapes, dots, whatever shape you like. • Bake cookies for 4 hours on 175° until cookies are completely dry. • Transfer your cookies while still on the parchment paper (don’t remove hot cookies from the parchment paper!) to wire racks to cool, approximately 30 minutes. • Remove cookies from parchment paper when completely cool. • Store in an airtight container for up to one week. • Note: if stacking the Lemon Meringue Cookies in a container or bag, place parchment paper between stacked rows of cookies. Ever wanted to make a cookie that is sophisticated, and seems like you slaved all day in the kitchen, but you really didn’t? These are those cookies! They take about 15-20 minutes to set up, then the oven takes over and dries them out. You do nothing after those first 15-20 minutes, the oven does all the work! I cannot emphasize enough how truly simple these cookies are to make. They look snazzy due to the pastry piping, and a few drops of yellow food coloring. When you store them (I use a Ziploc bag), make sure you put parchment paper in between layers. You don’t need it if you store as a single layer, but double or triple layers do. These are even better day 2 and 3! 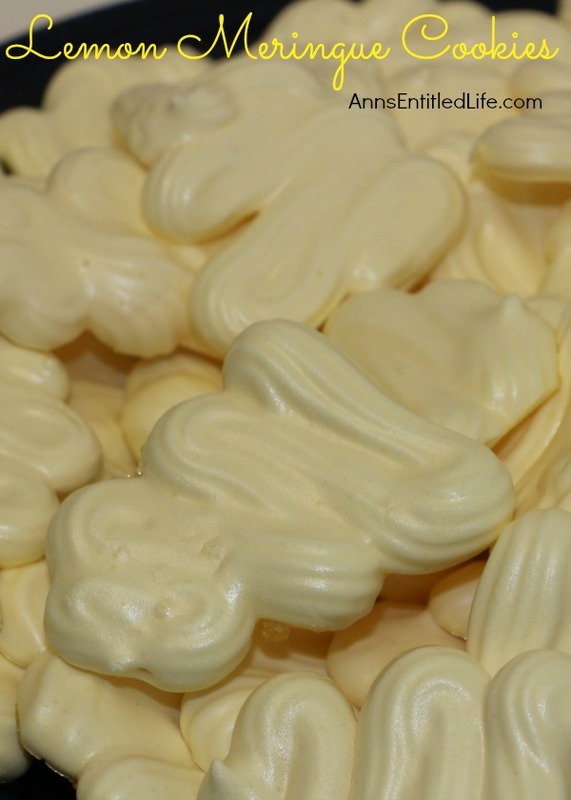 • To print the Lemon Meringue Cookies Recipe, click here. These cookies look amazing! I love lemon meringue pie-what fun to eat it in cookie form. Yum! What a delicious idea! It has been a while since I have since lemon meringue cookies. When I lived in New Your, years ago, this one bakery use to make them and they were to die for. You have my mouth watering for them again I have never made them, but that just might have to change. These sound delicious! 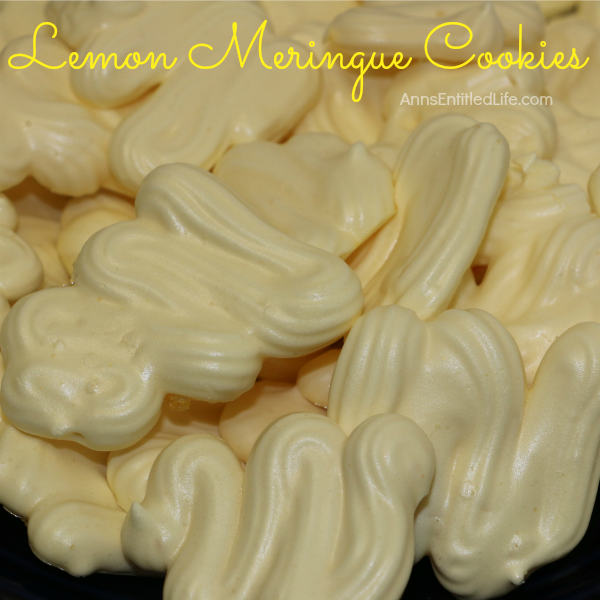 I love lemon, I love meringue… I’ll have to try the recipe. Found you at Think and Make Thursday.